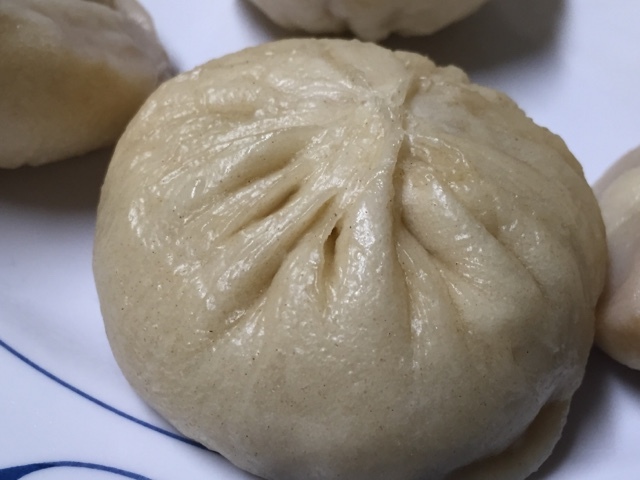 It's funny that we continue to try our quest in steaming perfect Chinese meat baos. Many people have posted their success in the YouTube and in their blogs, but that's the way it goes in anyone's kitchen who enjoy the challenge in successfully present beautifully prepared food - more cooking. 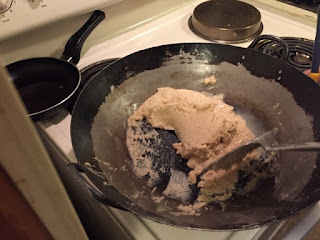 This reminds me of my early years when trying to make the ultimate southern biscuits where I dumped 3 dozens of biscuits or more before getting the right one. Finding that ultimate formula that would work in your kitchen keeps our mind sharp and family cooking together interesting. 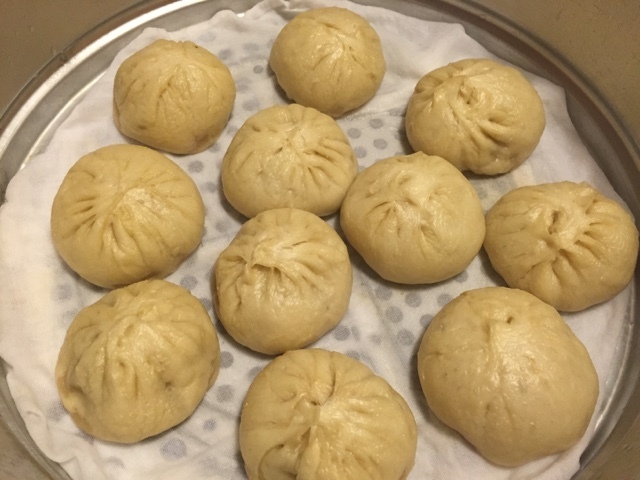 This is one of my mom's many trials in making Chinese meat bao in her extra large aluminum steamer. 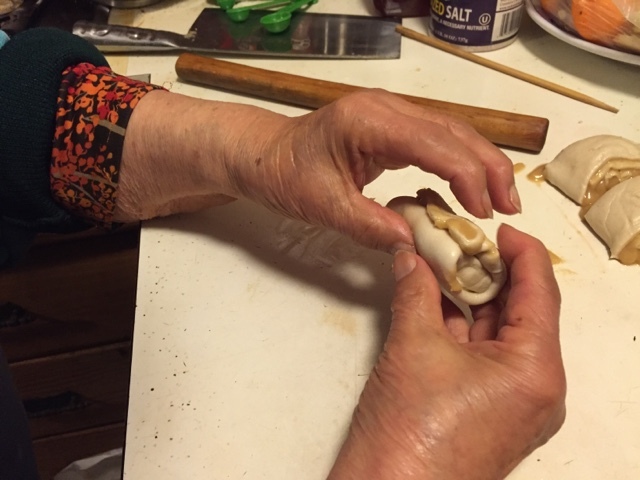 There was nothing to it when she used to make them in bamboo steamers in her early years. 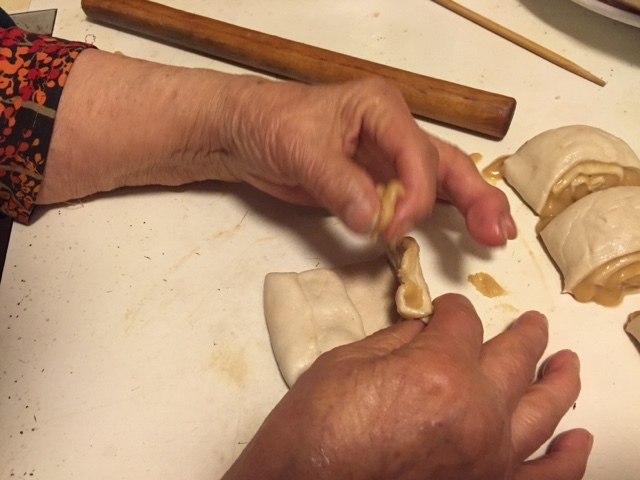 After enjoying the retirements for many years she wants to get back to making them again. But she noticed the diminishing of her memory of the "how to" beside her physical strength. So while she reads off the formula from collections of cookbooks and notes she had been collecting for years, I get to work. 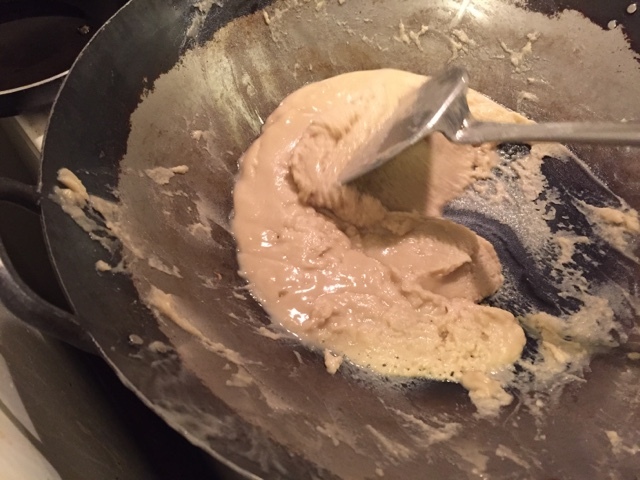 Mix all together and knead 7-8 minutes. 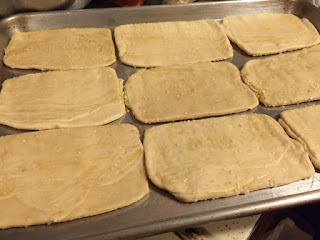 Cover and rise for 3--4 hours. Baking Powder - 2 tsp dissolved in Cold water 1/2 Tbsp. Add into risen dough and knead again. Mix all ingredients together, cover, and set aside. Leave some flour on a corner of the work surface. You will dip the bottom of the round dough with flour that you are holding on with fingers of one hand each time you roll out its edge with the other hand. Coat the sliced side of the dough with some flour to prevent sticking onto work surface. 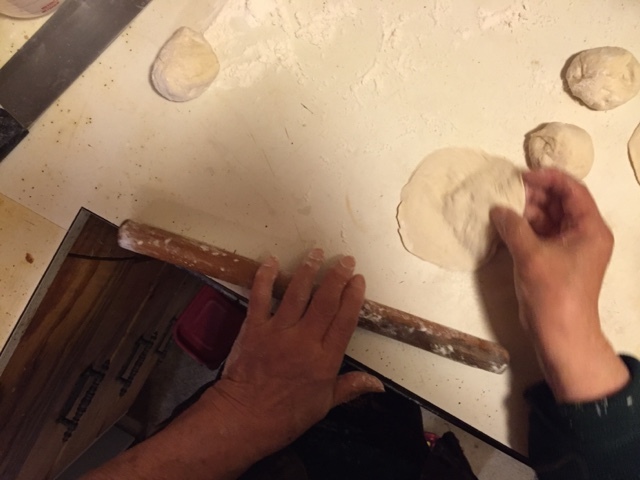 Press down the cut side of the dough round facing up with the palm of your hand. 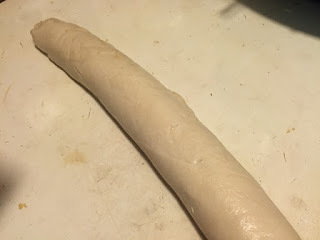 Coat the bottom of the round dough with flour as you roll the edge of the dough 'inward' then back to the edge, then turn the dough 1/8 of an inch at the same time its bottom is coated with flour and brought back to where you would roll with the other hand that is holding the rolling pin. Continue with this motion - coat, roll, turn, coat, roll.. until a full circle is complete. 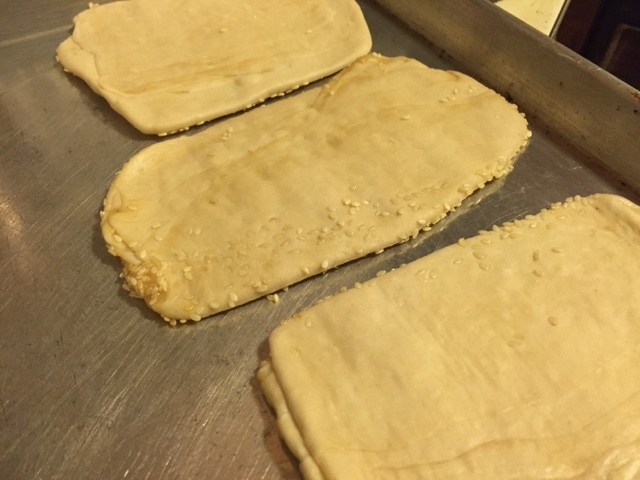 Fill the center of rolled dough with meat mixtures. 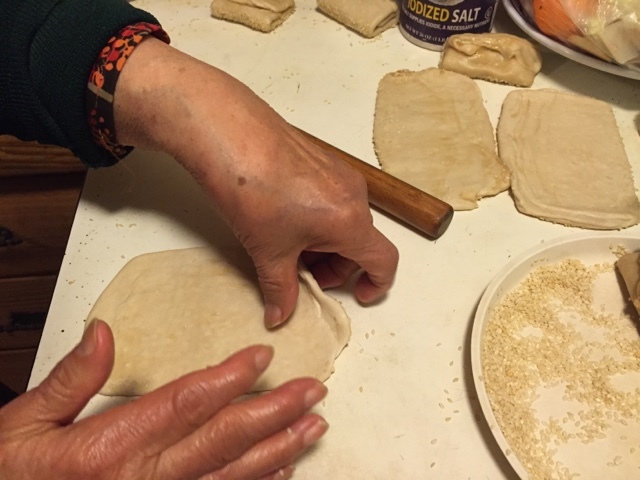 Enclose the dough by pulling the edge and folding them in Fan style and pinch close each fan seam to the previous. 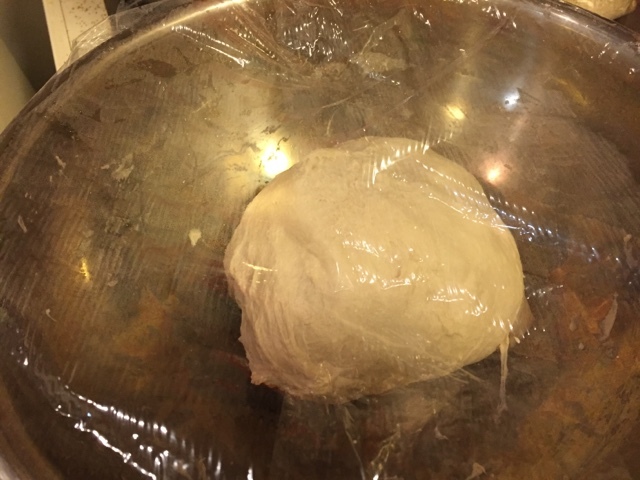 Place on slightly floured surface that you can cover with floured plastic wrap and towel to complete the final rise before steaming. Or place individual bao on top of a cut parchment paper square for each bao. Rest for 20 minutes in hot air-conditioned kitchen or cover and rest for minimum 30 to 40 minutes. 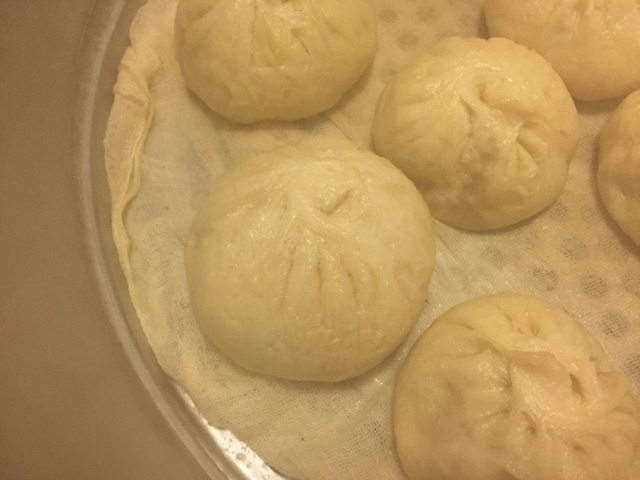 Start boiling water in steamer at low temp first while waiting for the bao to complete the final rise. Turn to high to bring to full boil. 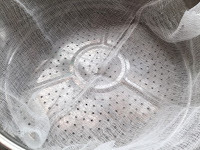 Line the bottom of steam basket with moistened cheesecloth. Transfer first 9 baos that you filled first to the lined steamer basket. 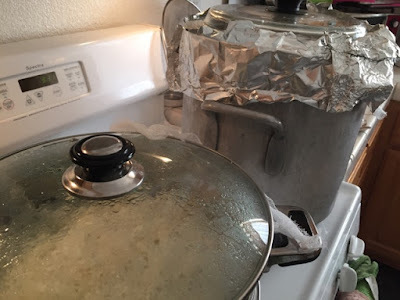 Cover and steam at high but one notch down for 15 minutes. At 15th minutes, without opening the lid, place a wooden spoon or an object under one side of the lid to allow cooking with released steam. Steam 5 more minutes. Without opening the lid or removing the wooden spoon, turn off the heat. Do not remove from the stove or from the bottom steamer pot. Cool for 5 minutes. Without opening the lid or removing the wooden spoon, remove just the basket with cracked open lid to a heat safe work surface. Cool for 5 minutes. At the end of 5 minutes, remove the lid quickly and away from baos to prevent steam droplets to rain on steamed baos. Serve on bamboo lined placemat to prevent moisture condensation at the bottom to cause soggy bottom. Or prop steamed bao sideways to cool in the steamer basket. Check the steamer's hot boiling water level. Refill with hot water and bring to full boil. Steam the next round the same methods. 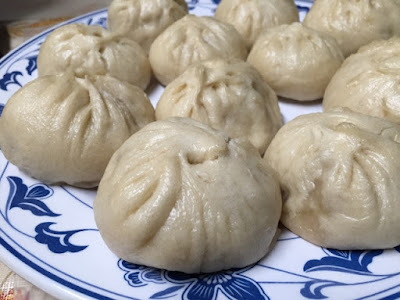 This is another fun adventure in making our favorite Chinese breakfast food. Normally, some of the food are so much easier to enjoy if you could just buy from the street vendors. But getting to the nitty gritty of the details to produce this Saobien is quite satisfying when you can't get hold of it in your neighborhood Asian grocery stores - the way you like it. Saobien is baked flaky flat bread usually topped with sesame. Our first experience was during our vacation in Taiwan. My parents were delighted to come across it as they missed it since they left mainland China. One early morning our family friend took us to go buy breakfast. They took us down into an alley filled with vendors selling soybean milk, "Yo-u Tiao" - Chinese fried bread stick, Saobien with braised beef with cilantro, Zou - porridge, etc. 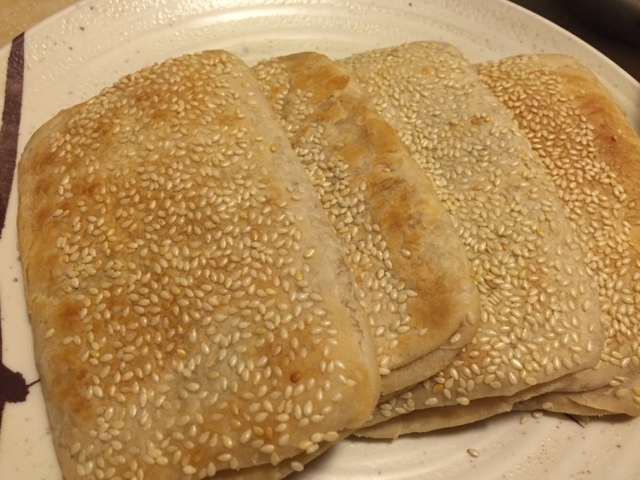 The flaky flat breads are baked in a large drum can style charcoal oven. They are quickly wrapped and we took them home to enjoy with everyone. My mother studied the formula and was contemplating to make it or not. But at her age, the long time standing in the kitchen cooking is not her favorite pass time anymore. But her curiosity lingers on to wonder how it would turn out. It gave her the motivation to test it. Hopefully it will be less painful then our previous Dim Sum adventure we had in making the 'Ho Fan' filled with shrimps. First part of the process is to make the browned Roux. This is the key ingredients to produce layers in the Saobien. Method 1: 2/3 cup oil, 1 cup flour. Bring oil to high heat. Add flour. Stir fry 5 minutes. Transfer to oven proof dish. Bake in 300'F for 30 minutes till brown. 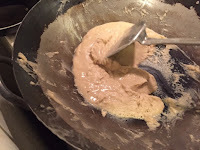 Method 2: 1-1/2 cup oil, 3 cup flour. Bring oil to high heat. Add flour gradually and stir fry till brown over low heat for 10 minutes. 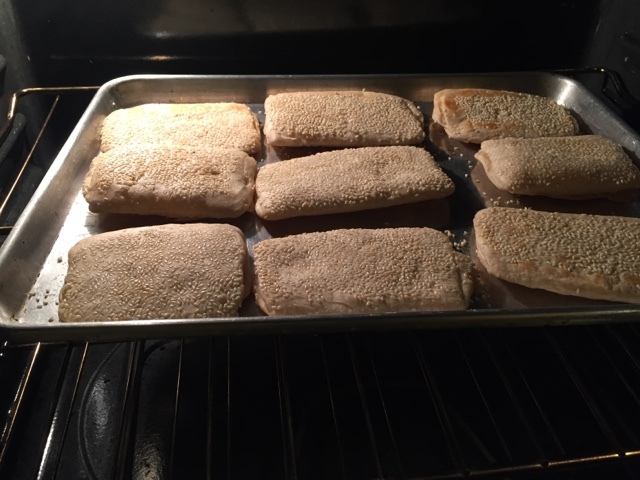 6 cup flour, add 1-1/2 cup boiling water. Mix; then add 1/2 cup tap water. 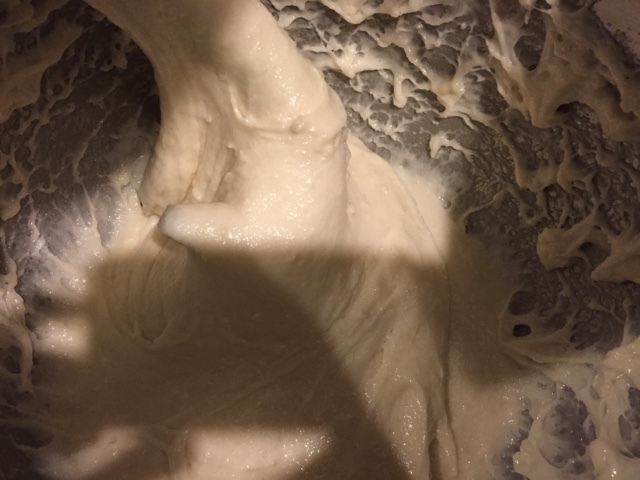 Knead for 7-8 minutes till smooth. Earlobe softness. Cover and rest for an hour. Rub some cooking oil on work surface. Divide the dough into halves or Roll out into 40x45 inch wide. Cover the other while you work with the other. Roll up with sliced end on top and bottom. 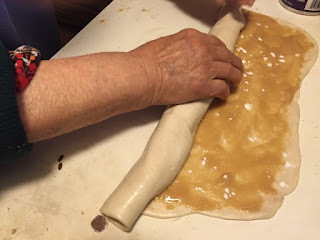 Place rolling pin 2/3 from the top and roll upward. 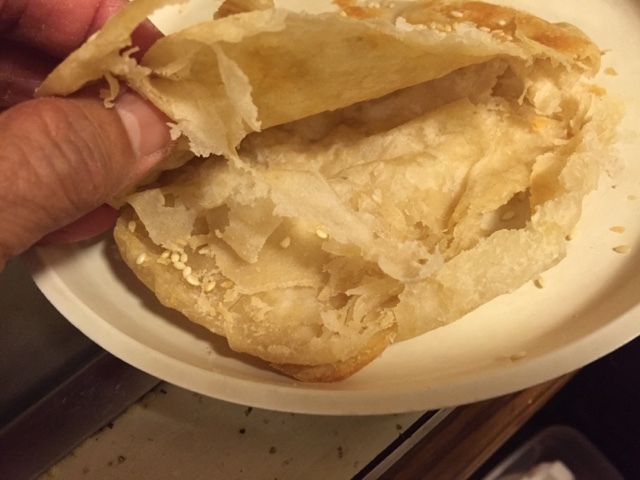 Press the bottom unrolled end of the dough to flatten a bit with fingers and fold the dough 2/3 way up and gold the top down. Press the dough to elongate slightly with fingers. Repeat the 2/3 roll with rolling pin. 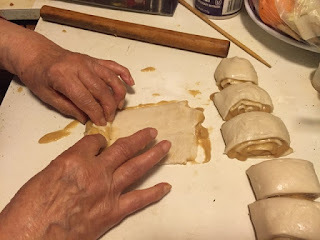 Roll it the second time with ends of fold at top and bottom. 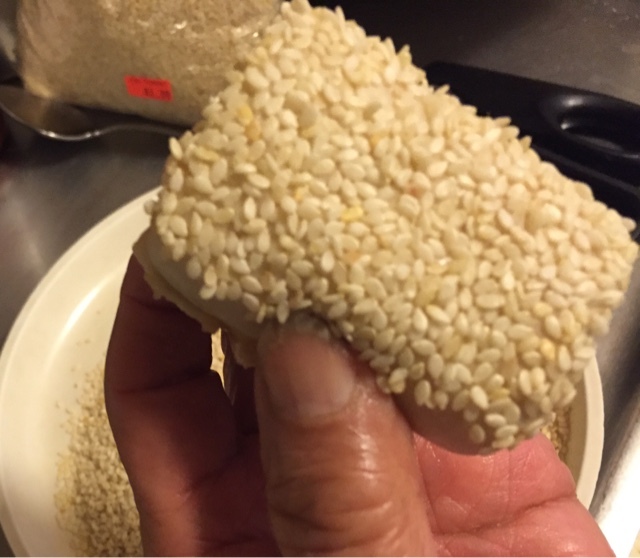 Fold into thirds and dip smooth side in sesame seeds. Place in baking sheet with sesame seeded side down. Rest at least 30 min - uncovered is okay. Bake in Center oven rack. Bake for 5 min or till it puffs up, then turn them over and bake till slight hint of tan color - about 5 minutes but no longer. 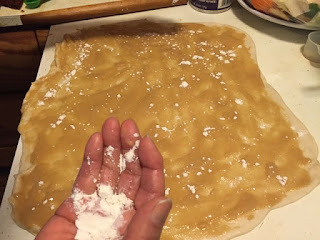 Unless it is still "white" like raw dough. I preferred mine bit more browning, but my mother said that will cause it to be tough when it cools down. Serve hot with braised beef Chinese style; luncheon meat or any spicy deli meat, fried eggs, etc, etc, will work as well. Toast in toaster the next day to enjoy. Each new year, it always bring back the fond memory of MOCHIZUKI - pounding of cooked glutinous rice into MOCHI cake. Every year the elders of the family across the street would bring out their Usu and big wooden pounder that looks like a gigantic hammer. 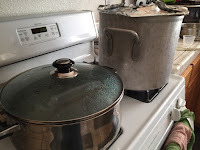 I watch the mother of the family bring out steamed glutinous rice and dump into Usu. The pounding starts immediately. It takes two people to complete a turn. A pounder and the flipper. 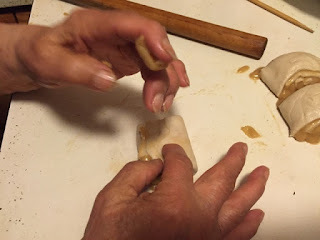 As the piping hot glutinous rice is pounded the helper would dip their hand into warm water, then flip the rice over right before another stroke of pounder comes down. The motion is so well coordinated that rice is pounded till every grain is pounded into MOCHI (glue like). 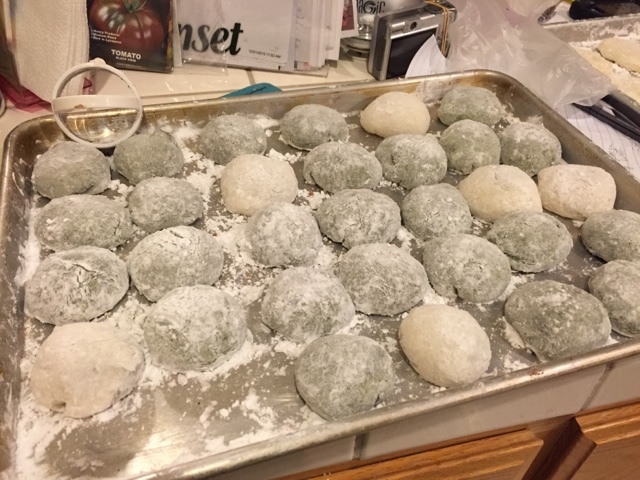 Then, everyone in the family and neighbor start working to form them into sweet red bean filled MOCHI cakes - DAIFUKU MOCHI. My adventure today is to find out if I can simulate the 'pounding' using my commercial mixer. The result? Success! 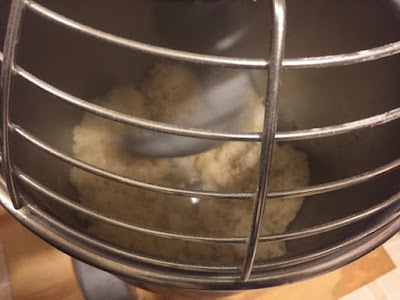 7 cups Glutinous rice - washed and soaked for two days in filtered water. 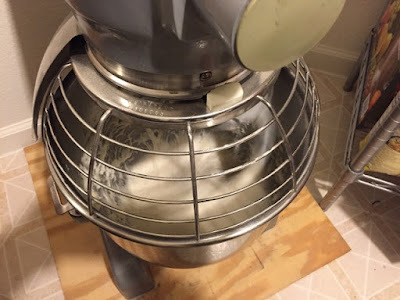 Get a small bowl of hot water and spatula ready; Place hot rice in mixer bowl immediately; attach dough hook, start kneading first in low speed, 2 minutes; change speed to 2, knead for 5 minutes, trickle 1 Tbsp hot water here and there, stop the machine and turn the rice over well. 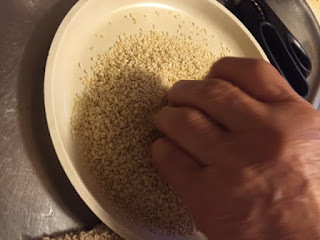 Continue kneading at speed 3 until all rice grains are smashed smoothly. Don't forget to trickle hot water from time to time on the side of the bowl. 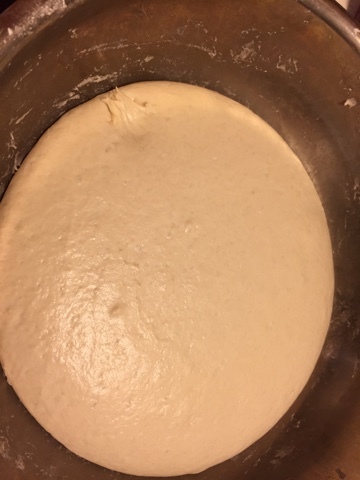 Knead about 12 minutes. Get baking sheets ready with KATAKURIKO - Japanese Potato Starch. 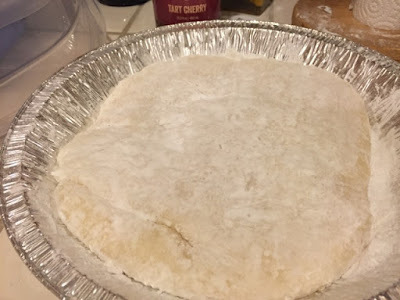 Transfer beaten MOCHI to baking sheet. Sprinkle the top with potato starch. 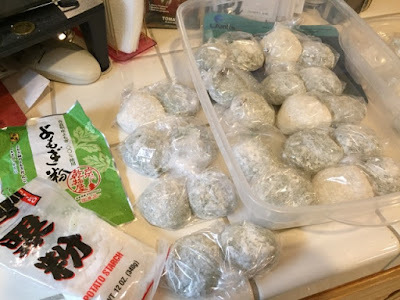 Spread the MOCHI with hands. Cut with biscuit cutter. Open a can of red bean paste, stir well, then heat in microwave for 30 seconds. Fill each cut out MOCHI with red bean paste. Enclose it. 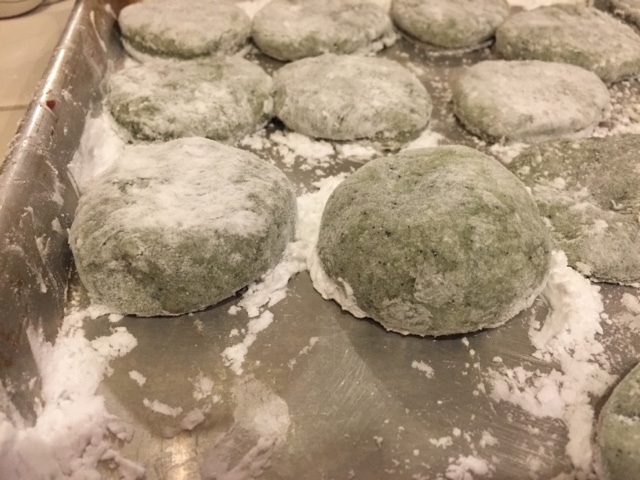 Dab some KATAKURIKO on the bottom and on top of filled MOCHI - DAIFUKU MOCHI to prevent it from sticking to the baking sheet or to each other. 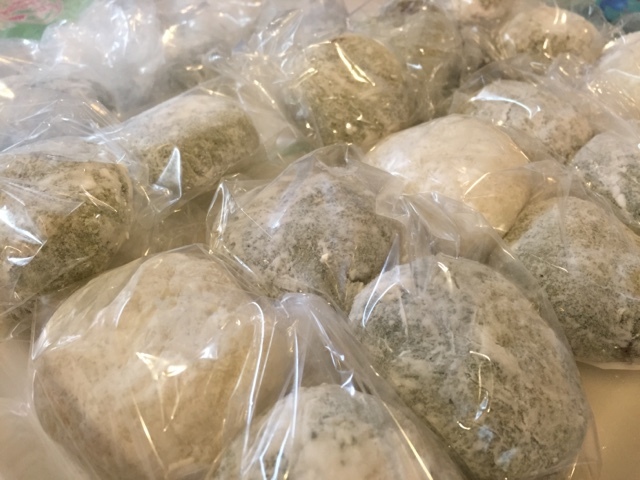 Wrap in plastic bag or sandwich bag. 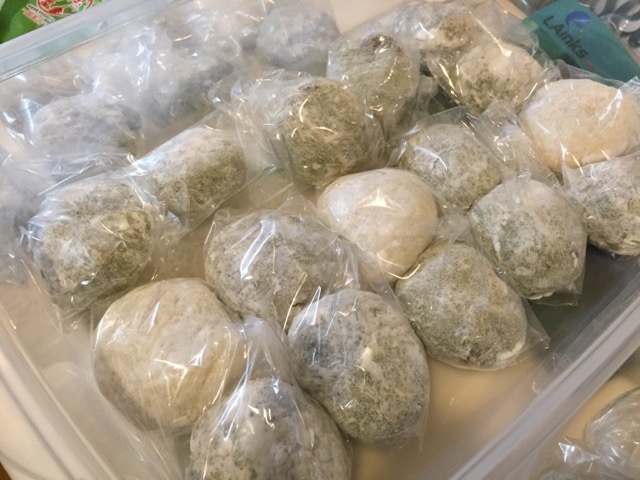 The test is to see if this method of DAIFUKU MOCHI will remain soft or hardens like a rock within a day. Or as soon as it is at room temperature. 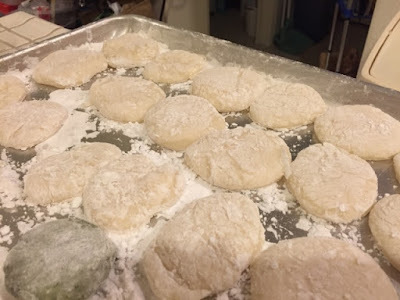 When I used automatic MOCHI machine, the MOCHI hardened within an hour. You would notice in the ingredient label of store bought DAIFUKU MOCHI has extra ingredients to extend its shelf life and softness, such as Xanam gum, tapioca starch. So this will be a great test. Same old rule - do not and never open the lid to check for doneness. 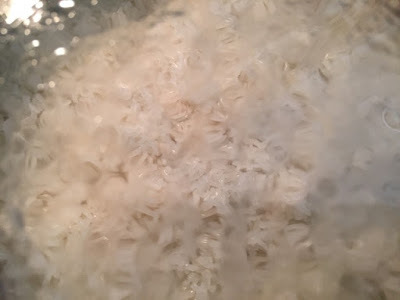 The rice will look plump and shiny. To refill the steamer's bottom pot, refill only with hard boiling water. 7 cups of soaked glutinous rice would produce about 12 -13 cups of soaked rice. 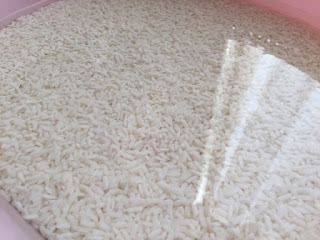 4 cups rice took about 2 hours of steaming. 9 cups took abut 3 to 3-1/2 hours to cook. Transfer to baking sheet covered with KATAKURIKO. 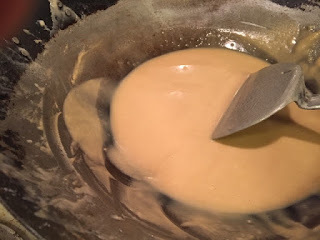 Save some in the bowl and mix with dry mogwart powder. 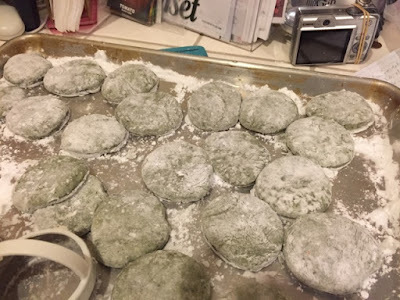 Then spread it on a baking sheet covered with KATAKURIKO. Flatten with hands, fingers and cut out with biscuit cutter. Fill with red bean paste and enclose it.